Casa A is the right house on the property and offers 70sqm of living space and a private covered terrace with lounge furniture. Beautiful is also the own garden, which offers thanks to a large poplar also a shady spot with a fantastic view. The living area was equipped with new sofas in 2017 and leads to the dining area with integrated kitchenette. From there, the two bedrooms with two single beds and the small bathroom with shower / WC go. The bedrooms have electric, fixed radiators. Casa B is the left house on the property and offers 80sqm of living space. The special is the small conservatory in front of the living room with lounge furniture. In addition, guests have a large terrace with table and chairs and sun loungers available. The unobstructed view of the Aridane valley and the Atlantic is unique. The large living area has a cozy fireplace surrounded by a sofa and two armchairs. The bathroom has a small shower bath and toilet and a sink with cabinet and large mirror. The bedrooms have heating and have a double bed and two single beds. 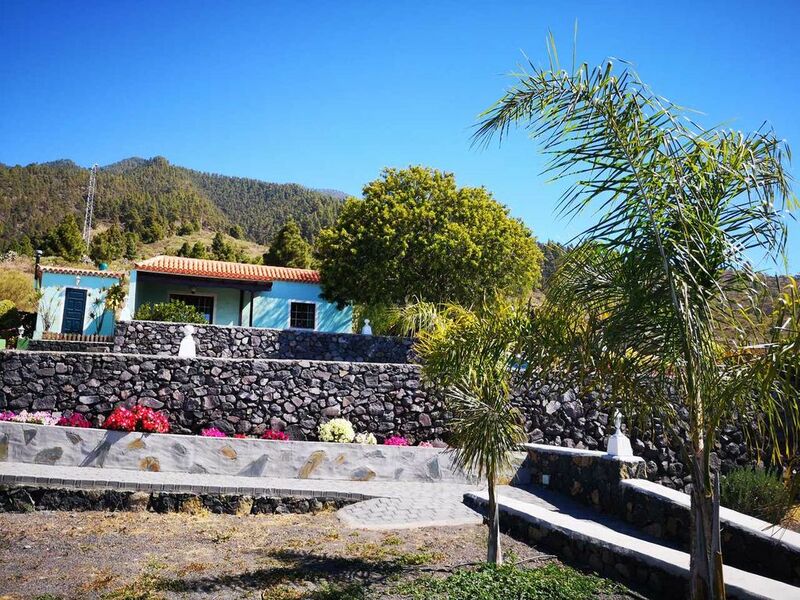 Casas Bejenado are 4 houses in a beautiful location above Los Llanos, with their unique view of Los Llanos and the Aridane valley trumps. Its name is due to the mountain Bejenado, a well-known hiking destination La Palmas. The two larger houses A + B are suitable for up to 4 people, the two smaller C + D for 2 persons. The houses are therefore also suitable for two friendly couples or two families. Each house has its own private outdoor area and the houses have fixed radiators in the bedrooms, so you can expect pleasant temperatures in the house even in winter. Important note: The road that leads to the house has a rough, uneven section of about 450m. Please drive carefully and with a sufficiently motorized rental car. Sauber und funktional. Sehr zu empfehlen. Küche, Bad, deutsches Fernsehen. Die Anfahrt zur Unterkunft ist nicht ohne. Mann hat einen tollen Blick auf den Atlantik. Die Terrasse und der Garten laden zum gemütlichen Ausklingen des Abends ein. Parkmöglichkeiten sind direkt am Haus vorhanden. La maison est parfaite pour 4 personnes. Elle est bien équipée. La voiture doit effectivement monter une côte bien pentue et non revêtue sur les derniers mètres. Une superbe vue depuis la maison. Die Unterkunft liegt recht hoch an einem Hang und bietet einen traumhaften Blick über die gesamte Ebene von Los Llanos. Man sollte ob der abseitigen Lage besser einen Mietwagen haben, bis nach Los Llanos sind es zu Fuß mindestens 30 Minuten. Die Unterkunft ist zweckmäßig eingerichtet mit allem, was man braucht, zudem in einem sehr gepflegten Zustand. Die Terrasse ist riesig. Insgesamt sehr gutes Preis/Leistungsverhältnis. Anfahrt etwas holperig, hübsches Gärtchen mit verschiedenen Sitzplätzen, bietet zu jeder Tageszeit einen sonniges und windgeschütztes Platz. Wir haben jeden Tag draussen gefrühstückt. Abends war es im Wohnzimmer sehr kalt. Aner es liegen flauschige Decken bereit. Alles Nötige ist vorhanden. Casas Bejenado are on the edge, far above the center. You have an exclusive view of Los Llanos and the Aridane valley. By car you are in 5min downtown for shopping and eating out or taking a Cortado on the plaza. The bus station can also be reached in 5 minutes. Los Llanos is traded as the secret island capital and invites with its pedestrian zone and a beautiful Plaza again and again to a city stroll. In the Market Hall there is a daily market where you can buy fresh fish, fruits and vegetables and other local products. The house is also an excellent starting point for hikes. Within 10 minutes you are with the car in the caldera and can walk from there to Los Brecitos or to the Barranco de las Angustias. The Cumbrecita can be reached in 15-20min. The large sandy beaches in Puerto Naos (11km) and Puerto de Tazacorte (7.5km) are easily reached by car. Buses leave every hour.